Calling Readers - Good HS with Robust Vocational Program? Hi, I am a parent of an eighth grader, and am trying to find a high school for my son in San Francisco. He has struggled with academics, but excels at vocational-type work – carpentry, art, design and the like. In other words, he loves to work with his hands. Could you post and ask whether readers have suggestions of good high schools that have robust vocational programs? I am finding absolutely no information on this topic, and am somewhat stumped. If there are training programs for high school-aged kids that are outside schools too, I would also be interested. Thanks for the help! This is such a great question, I hope people chime in with their thoughts. I have heard that the district has brought in Big Picture Learning to run a school in the district. Big Picture is supposed to be an interesting model, working individually with each student to figure out the best curriculum for them, and typically having students in internships several days a week. I think the school they are running has at least some focus on court-involved youth and drop-outs, though, so I'm not sure if that's a great fit for your child, but you might check it out. The school is on 7th Avenue at Irving St and I think it's called the Principal's Center Collaborative. Good luck! 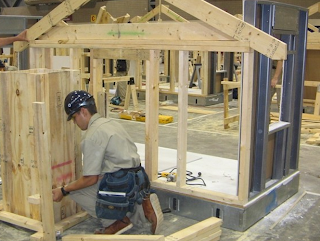 John O Connell High school in the Mission has a carpentry program. SOTA - for set design? We know a family that chose one of these, can't remember which one. The kid is into jazz band, not athletics, he's been happy. Check out Gateway charter too, supposed to be smaller than the big Wash and Lincolns and not too demanding. Do you think he might want to learn a skilled trade for a professional career? If so, maybe look into some community college classes or talk to some trades people. Maybe he could get a part-time job and start apprenticing when he turns 16. All the skilled trade people I know make a good living and don't have to worry about their jobs leaving the City. Cabinet makers, carpenters, plumbers, electricians, landscapers, and auto mechanics will always have work. In a city like this, high-end craftspeople definitely make a good living. O'Connell is great for this! What a hatchet job! O'Connell has been a leader in this area but has never received the respect it deserves. It's a great school for this. All the above suggestions are great. O'Connell is a traditional A-G academic high school that also happens to have pathway programs in carpentry, drafting, networking, biotechnology, and culinary. Great, community-oriented small school in SF. More than the typical year long of programs, I would go for online trade schooling.